Property 21: Bayview, Tryphena. Overlooking Puriri Bay. 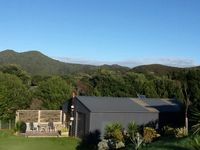 Property 28: On popular Medlands Beach, centrally located. Property 35: Yardmaster House, large 3 bedroom home, sleeps 8. 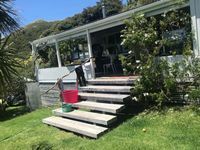 The beach hut is in a lovely peaceful location, within a few steps of the beautiful Medlands Beach. The Hut is what you see in the pictures, one space for living, and a good shower room/toilet. It provided all we needed, even a coffee plunger and knives sharp enough to cut with, items which aren't always available in holiday lets! The pots, pans, crockery and glassware were all clean and plentiful for a week's stay, bearing in mind that you will have just two gas burners to cook on.